Antibiotics are chemicals which kill bacteria or stop them growing. Many are made by other microbes as part of their own defences. Chemists have developed these for medical use and invented some others that do not occur naturally. Their discovery nearly fifty years ago revolutionized the treatment of bacterial infections and greatly enhanced the reputation of medical science. It involved, however, the removal of a natural mechanism from its proper context and a big increase in the scale of its use. This called for much responsibility and discretion, far more than was actually exercised. 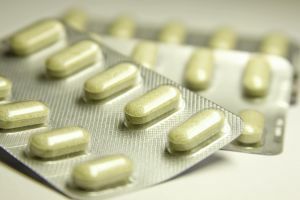 Consequently antibiotics are used far too often, mostly when bacteria are not even involved in the disease being treated. Particularly unfortunate is their routine use in low doses to promote the growth of animals for food. You consume these antibiotics in their meat, but in doses too low to eradicate the bacteria in your colon or on your skin. As a result many are now resistant to destruction by the simplest and safest antibiotics. These resistant varieties thrive at the expense of the non-resistant, altering the kinds of bacteria that live alongside us and perhaps contributing to new diseases like colitis and irritable bowel syndrome. They have reinstated some old fashioned diseases too, like gastro-enteritis, that antibiotics were supposed to have conquered. Meanwhile habitual assistance from antibiotics is making us lazy. We pay too little attention to ordinary hygienic precautions, instead expecting antibiotic treatment as soon as we become ill. Because of this our defences are challenged insufficiently to establish adequate immunity to those bacteria we do encounter, so that we are still vulnerable next time we meet them. What is more, every course encourages the growth of fungal diseases like thrush. All in all, we are behaving exactly as if we wanted antibiotics to become progressively less and less useful to us. Unless we change our habits drastically, during the next few decades we shall become increasingly reliant on antibiotics that will let us down more and more, giving us increasingly troublesome side effects all the time. We shall, in effect, be addicted to them — and on skid row. 1. Look on antibiotics as a precious capital reserve, to be used seldom if at all. Do not assume they will always be available, safe and effective. 2. When a sore throat is part of a cold, antibiotic treatment will not help you. Use antiseptic lozenges or gargles for at least three days before seeking medical help. See the red sage tea and garlic lozenge remedies and Vitamin C.
3. Most earache is caused by pressure from trapped catarrh, not infection at all. Make clear to your doctor that you understand this and would prefer to avoid antibiotic treatment unless and until infection gets into the catarrh. 4. Hold out even against bacterial infections for at least three days if you can.Then your own immune defences are properly alerted, so that enough antibody protection is built up for the future. You will not then need any treatment next time you meet this germ, and will probably not even feel unwell. Try garlic, propolis and Vitamin C as antiseptics, as well as local antiseptic applications like Potassium Permanganate, or Potassium Chlorate and Phenol Gargle. After three days you will know if you need extra help. An antibiotic course will then speed your recovery but your own system will gratifyingly do most of the work. 5. Delay is unwise for seriously ill children, or anyone feverish with severe headache or neck stiffness. Even then let your doctor decide whether and how soon to use antibiotic treatment; don’t pressure him. 6. Complete any antibiotic course you start, exactly as instructed. Vitamin B5 (Pantothenic Acid, 50mg twice daily) can reduce side effects. 7. If side effects do occur during antibiotic treatment, talk to your doctor before dropping the course. 8. Follow the course immediately with live yoghurt recipe at each of three meals daily, on its own or with fruit and cereal. This helps to discourage thrush and restore digestion by re-colonizing your intestine with the friendly germ Lactobacillus aerogenes, which the antibiotic will have killed off. If you buy your yoghurt from a grocer, make sure it is unpasteurized: natural yoghurt is not necessarily live.